This lesson plan has been adapted for WABE’s platform. Click here for a printable version of this lesson plan. 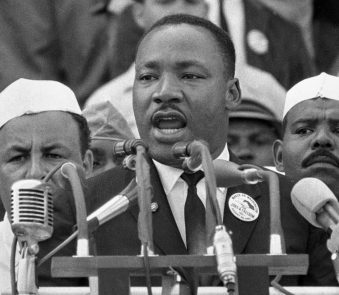 Students will study Martin Luther King Jr.’s “I Have a Dream” speech and discuss the rhetorical influences on King’s speech, the oratorical devices that King uses in delivering his speech and how a speech is similar to/different from other literary forms. Dr. Martin Luther King Jr.’s most memorable speech from his life as an activist, “I Have a Dream,” was delivered August 28, 1963 before more than 200,000 people in front of the Lincoln Memorial in Washington, D.C. as part of the March on Washington for Jobs and Freedom (see Online Newhour article link below). 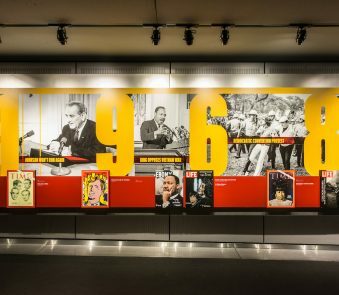 The speech not only helped to galvanize the already growing civil-rights movement across the country at the time, it also became one of the most influential and inspirational pieces of rhetoric in American history. Remarkably, midway through his delivery, King suspended his pre-scripted text and began to improvise; what resulted was the speech’s most recognizable section, the passage in which the words “I have a dream” are passionately repeated. Indeed, King’s background as a Baptist preacher in the South instilled in him a keen awareness of the urgency of the moment and the ability to make sudden alterations to his plans. This skill helped King establish a rapport with his ever-changing audience so that he could consistently communicate on a meaningful level, a skill that was demonstrated at the March. 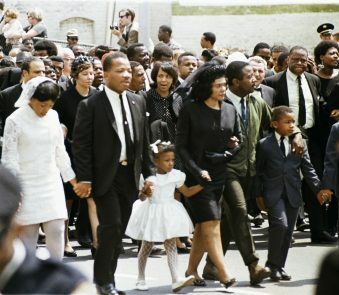 What is also apparent in “I Have Dream” is King’s deep commitment to scholarship (he earned a Ph.D. from Boston University). King was clearly well versed in both American history and religious scripture, and he seamlessly weaves references to both into the fabric of his oration. Overall, “I Have a Dream” can be held up as a masterful creative work in itself; its dramatic structure coupled with its image-laden content render a remarkably moving piece of American literature that when read even outside of its original context still strongly resonates today. Distribute the complete text of “I Have a Dream” (see link below) and watch the accompanying video of students reading the speech. Review literary terms (see link below) with the students. How do these uses enhance the overall impact of the speech? For this activity, have the students compare the structure and content of “I Have a Dream,” Lincoln’s “Gettysburg Address” and Kennedy’s inaugural address (see links below). This activity may be done with any number of other influential speeches as well (see links). A primary goal here is to help the students see the common structural and figurative threads that tie together many famous oratorical works. Author Doug DuBrin currently teaches English and history at the French International School in Bethesda, MD. He has also taught English and history at Arizona School for the Arts in Phoenix. Doug is also a freelance writer and editor.